www.dead-donkey.com • View topic - Why do I always end up here when I've been drinking? Why do I always end up here when I've been drinking? Posted: Tue Apr 16, 2013 3:01 am Post subject: Why do I always end up here when I've been drinking? I visit on a regular basis, but tonight, I'm feeling all lovable and horny..
Posted: Tue Apr 16, 2013 3:10 pm Post subject: Re: Why do I always end up here when I've been drinking? He has that effect on people. Posted: Wed Apr 17, 2013 9:34 am Post subject: Re: Why do I always end up here when I've been drinking? Posted: Wed Apr 17, 2013 6:04 pm Post subject: Re: Why do I always end up here when I've been drinking? 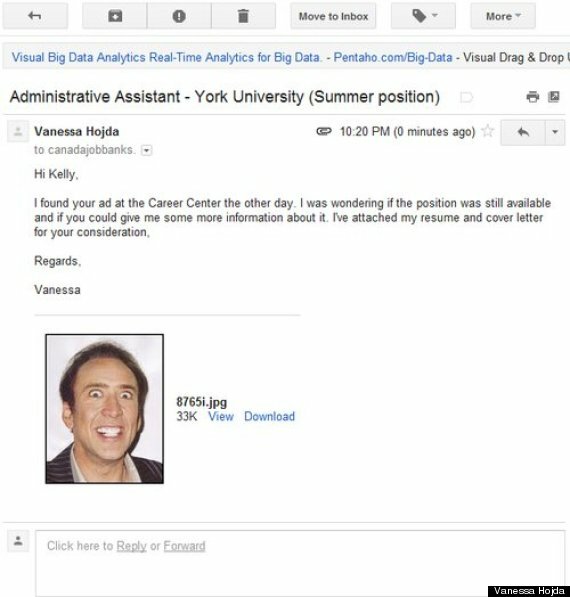 Posting the image above to her Tumblr blog with the words "“I ACCIDENTLY SENT MY POTENTIAL FUTURE BOSS A PICTURE OF NIC CAGE RATHER THAN MY COVER LETTER + RESUME, WHICH HAS A ZIP FILE TITLED WITH A BUNCH OF NUMBERS LIKE THE JPC I ACCIDENTALLY ATTACHED OH MY GOD,” she swiftly became a viral sensation - and now, as it turns out, a viral sensation with a happy ending. Posted: Wed Apr 17, 2013 8:32 pm Post subject: Re: Why do I always end up here when I've been drinking?